For many children with serious illnesses, traveling to and from the hospital is a tiring part of treatment. Delta people hoped to help ease that pain a little bit for children at Beaumont Children's Hospital by donating luggage from the airline's uniform wear test held earlier this year. Flight attendants who participated in the wear test recently visited the Detroit-area hospital, where they helped with an art project and surprised the children with 35 pieces of lightly wear-tested luggage. 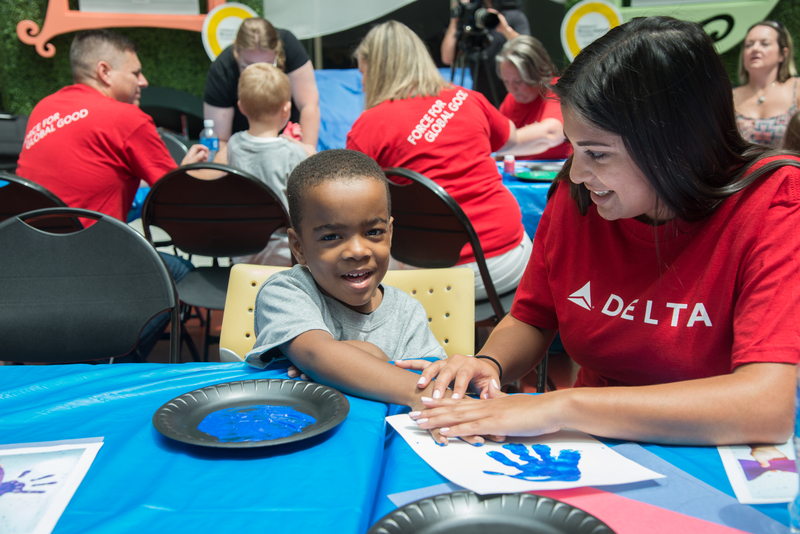 The effort is part of Delta's giving strategy in Detroit – the airline is a corporate sponsor of the hospital and has a national partnership with Children's Miracle Network Hospitals. "We had 300 suitcases from our wear test and wanted to give them away to good causes," said Ekrem Dimbiloglu, Director – Airport Customer Experience. "It feels great to be here and supporting one of the local communities Delta serves." The rest of the luggage has been or will be donated to other nonprofits including Covenant House, Brighton Center, Make-A-Wish and additional Children's Miracle Network Hospitals around the U.S.
Ben Sotelo, a Detroit-based flight attendant who volunteered at the event added: "The best part of today was just getting to play with the kids and getting them away from the 'hospital' part of their treatment." When the Delta team unveiled the surprise, kids immediately ran up to grab their own luggage and unzipped the pockets to put their toys inside. Alex, a 7-year-old who was at the hospital supporting his sister, said he would use the luggage to go to Florida – to Disney World, of course. "Kids with cancer come in and out of the hospital all the time. They've got to travel a lot," said Kathleen Grobbel, Child Life Services at Beaumont Hospital. "This has been really exciting – no one has done this for them before." The wear test, conducted from December 2016 to March 2017, gave 1,000 Delta employees a chance to try out the new uniforms and provide feedback before the collection's official roll out in 2018. Participating flight attendants tested four brands of suitcases, nearly 600 pieces of luggage. After the wear test ended, the airline looked to recycle or donate each uniform to make sure nothing went to waste. In addition to the luggage donation, Delta partnered with fabric recycling programs MartexFiber and re-loom to give the uniforms new life.